Today is your last chance to see Michael Asher's proposed work for the Whitney Biennial. Initially he planned to have the Museum open for 24hours a day for one week. 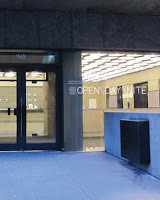 According to the Whitney's website, "due to budgetary and human resources limitations, the Museum is unable to remain twenty-four hours a week for one week. As a result, this work has been shortened from seven days to three days." And those three days end tonight at 11:59pm. During these hours the Museum operates as it always does, with galleries open to all visitors. Both the book store and the cafe with also be running. Asher is famed for challenging art institutions to change conventional aspects and creating new perspective. Swing by the museum anytime before midnight tonight to get the final view of Asher's work (though arguably unfinished due to time constraints).